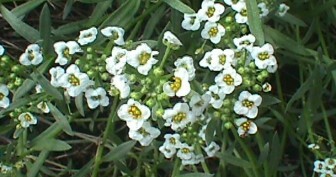 Sweet smelling, fast growing, dwarf growing plants with clusters of tiny flowers. Alyssum is delightful for edging, rockeries and ground cover. It drapes attractively over containers, rockeries and walls. Perennial but often treated as an annual, it often self-sows. Responds well to trimming, especially after winter. Plant all year round in most climates for flowers all year round. Prefers full sun. Will grow in semi-shade. Singles or mixes of purple, pink, white & lavender. Borders, edging, rockeries, mass planting, between bricks or stones in paths and paving, containers.